Posted on 27, January 2016 by EuropaWire PR Editors | This entry was posted in Automotive, Belgium, Germany, Transportation & Logistics and tagged Bridgestone, Eduardo Minardi, touring tyre. Bookmark the permalink. BRUSSELS, 27-Jan-2016 — /EuropaWire/ — Bridgestone, the world’s number one rubber and tyre manufacturer, announces the launch of Bridgestone DriveGuard, a new game-changing touring tyre – bringing additional benefits and safety for all consumers – designed to be fitted on to all passenger cars1 to remove concerns relating to tyre damage (including in sidewall and tread areas) and to deliver the highest standards of safety, wet performance, comfort and fuel efficiency; giving drivers additional peace of mind, safety and convenience. Capability to be fitted on to all passenger vehicles regardless of the manufacturer or model1. 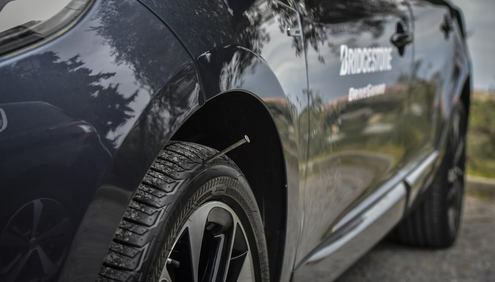 Bridgestone DriveGuard is not restricted to a factory fitment on specific brands or car models and can be fitted on to most cars equipped with TPMS, which is mandatory in Europe on new cars since November 2014 and gives a potential car park of 32 million vehicles to be equipped with DriveGuard in 2016. Unique response to virtually all kinds of tyre damages (including sidewall and tread) which is unlike other tyre mobility solutions (e.g. sealant). The new age DriveGuard technology uses a proprietary high-tech cooling fin design as well as supportive and tough reinforced sidewalls which allow drivers to maintain control and continue driving safely and comfortably for 80km at up to 80km/h after a puncture, until it is safe to either repair or replace their tyre providing additional peace of mind related to tyre damage. “No compromise” philosophy. Bridgestone DriveGuard offers best in class performance with no compromise on wet or rolling resistance as supported by the excellent EU tyre Label values (A for Wet Performance and C for Rolling Resistance) and independent testing by TÜV Süd demonstrating that Bridgestone DriveGuard ranks highly in performance categories that are important to drivers, such as wet safety, placing DriveGuard at the frontline of road safety. Eco-conscious nature. Bridgestone DriveGuard not only eliminates the need to carry a spare tyre thereby putting less weight on the vehicle, it is also fully recyclable through the conventional recycling circuit; this is not the case with other tyre providing mobility solutions. Bridgestone EMEA, with headquarters in Brussels, Belgium, is a key regional subsidiary of Tokyo-based Bridgestone Corporation, the world’s largest manufacturer of tyres and other rubber products. Bridgestone EMEA operates an R&D center, 13 plants and offices in more than 35 countries, with around 19,000 employees. Bridgestone EMEA’s premium tyres are sold in Europe, Russia, Middle east and Africa and globally. Currently not available for vans. Only for cars equipped with a Tyre Pressure Monitoring System (TPMS). For more details please visit www.bridgestone.co.uk/driveguard. TÜV Süd report: Bridgestone DriveGuard ranks high in following criteria compared to competing tyres: straight hydroplaning, lateral hydroplaning, dry braking asphalt and lateral wet grip and at par Test data and results are available on request directed to the above-mentioned address.